Once upon a time, computers with less horsepower than your mobile phone, were big. Real big. How big? This big. 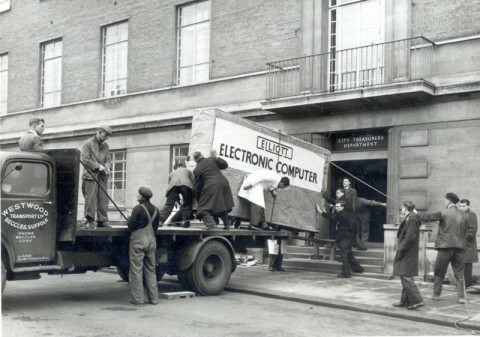 Norwich City Council’s first computer, being delivered to the City Treasurer’s Department in Bethel Street, Norwich in 1957. The City of Norwich, and its forward-thinking Treasurer, Mr A.J. Barnard, were pioneers in the application of computer technology to the work of UK local authorities and businesses. In 1953-4, Mr Barnard and his team began looking for an electronic system to handle its rates and payroll. They began discussions with Elliott Brothers of London in 1955, and the City Council ordered the first Elliott 405 computer from them in January 1956. It was delivered to City Hall in February 1957 and became operational in April 1957. The event was celebrated by a demonstration of the machine in front of the Lord Mayor of Norwich and the press on 3 April 1957. For more vintage moments in computing, please enjoy some of the "relateds" below.